Contains: Lepthyphantes, Mughiphantes, Agyneta, Haplinis, Parafroneta, Linyphia, Laetesia, Diplocephalus, Erigone, Walckenaeria. The Linyphiidae are a hyperdiverse family of small spiders, most of which build delicate sheet webs among vegetation. They include the Erigoninae, money spiders (sometimes treated as a separate family), very small spiders that are usually dark and shiny, and often have the frontal region of males modified with lobes, pits or setal fields (Jocqué & Dippenaar-Schoeman 2007). The Linyphiinae are united by the presence in males of the lamella characteristica, a sclerite of the embolic division of the pedipalp. Characters (from Jocqué & Dippenaar-Schoeman 2007): Very small to small; eight eyes present; labium rebordered; chelicerae usually with stridulating file; numerous teeth, mostly three or four, on fang furrow; legs slender, provided with setae, especially on tibiae and metatarsi; autospasy at patella-tibia joint; tarsi cylindrical, with three tarsal claws; tarsus IV without comb; ecribellate; entelegyne; male palp with often U-shaped intersegmental paracymbium. [C90] Crawford, R. L. 1990. Discovery of Caviphantes saxetorum in North America; status of Scironis tarsalis (Araneida, Linyphiidae). Journal of Arachnology 18: 235–236. [DH14] Draney, M. L., J. A. Hegnet, A. L. Johnson, B. C. Porter, C. K. Justmann & P. S. Forsythe. 2014. Microhabitat distribution of Drapetisca alteranda, a tree trunk specialist sheet web weaver (Araneae: Linyphiidae). Journal of Arachnology 42 (2): 195–198. [D93] Dresco, E. 1993. Remarques sur la systematique des araignees et des opilions. Bulletin de la Societe d’Histoire Naturelle de Toulouse 129: 23–24. [E95] Elgar, M. A. 1995. The duration of copulation in spiders: comparative patterns. Records of the Western Australian Museum Supplement 52: 1–11. [F75] Forster, R. R. 1975. Biogeography and ecology in New Zealand. XII. The spiders and harvestmen. Monographiae Biologicae 27: 493–505. [H39] Hickman, V. V. 1939. Opiliones and Araneae. British, Australian and New Zealand Antarctic Research Expedition Reports Series B 4: 157–188. [JDW90] Jennings, D. T., J. B. Dimond & B. A. Watt. 1990. Population densities of spiders (Araneae) and spruce budworms (Lepidoptera, Tortricidae) on foliage of balsam fir and red spruce in east-central Maine. Journal of Arachnology 18: 181–194. [K08] Klaus, D. 2008. Aggregationen von adulten Zwergspinnen der Art Oedothorax apicatus (Blackwall, 1850) auf angefertigten Gespinsten (Araneae, Linyphiidae, Erigoninae). Mauritiana 20 (2): 381–389. [P-GGJ08] Penna-Gonçalves, V., C. R. M. Garcia & H. F. Japyassú. 2008. Homology in a context dependent predatory behavior in spiders (Araneae). Journal of Arachnology 36 (2): 352–359. [SG14] Sharma, P. P., & G. Giribet. 2014. A revised dated phylogeny of the arachnid order Opiliones. Frontiers in Genetics 5 (255): 1–13. [W76] Wunderlich, J. 1976. Spinnen aus Australien. 2. 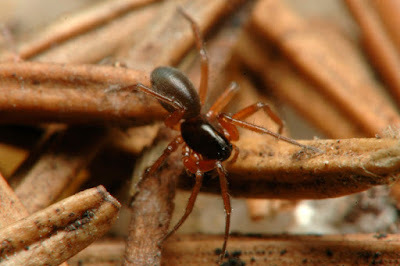 Linyphiidae (Arachnida: Araneida). Senckenbergiana Biologica 57 (1-3): 125–142.